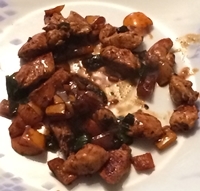 A recipe for Thai Basil Chicken Stir-Fry had been sitting in my Living Cookbook database since it appeared in the June 2015 issue of Cooking Light. I was looking for something simple to make for a recent dinner and I realized that it had been too long since I had pulled out the wok. This one filled the bill on both counts. In a manner rather unusual for me, I actually stuck very close to the recipe as it was published. It turned out quite well. I forgot to add the lime juice at the end, which would have given it a little extra zing. I might have served it on top of rice, but I think we did fine without the extra refined carbohydrates. It was a nice meal.